Although car owners have been customizing their vehicles since the dawn of the automotive age, rarely has a car been known to customize its owner. 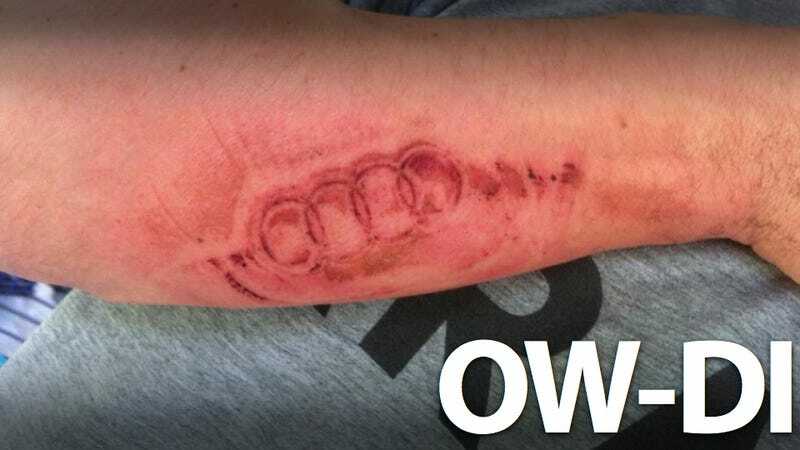 Until now — when an Audi driver allegedly found his arm branded with the steering wheel's four-ring logo when the airbag deployed. I mean, getting a tattoo to show your love of things automotive is nothing new, but rarely does it happen without the person's consent. Why Not Make Your Next Tattoo A Stick Shift Pattern? But that's what appears to have happened to one Jalopnik reader who crashed his Audi A4 and when the airbag deployed, his arm supposedly caught the steering wheel logo at the perfect angle to leave an iconic memento of the accident. But, instead of crying over spilt Audi parts, the West Virginia resident proudly displayed his branded arm in this photo he posted on Facebook and sent to us. Of course, accidents like this have been found, in the past, to be hoaxes — this looks more like an impact bruise than a permanent "branding."